Provided it’s warm enough you can stand it and not so windy you blow away, late February can be a great time to fish the Paradise Valley spring creeks. While streamers can draw a few big eats and if you luck into a calm day in the 30s or 40s there could be midge or winter BWO hatches, nymphing is the way to rack up the numbers. Here are my top three flies for late February. They remain good in March, too. 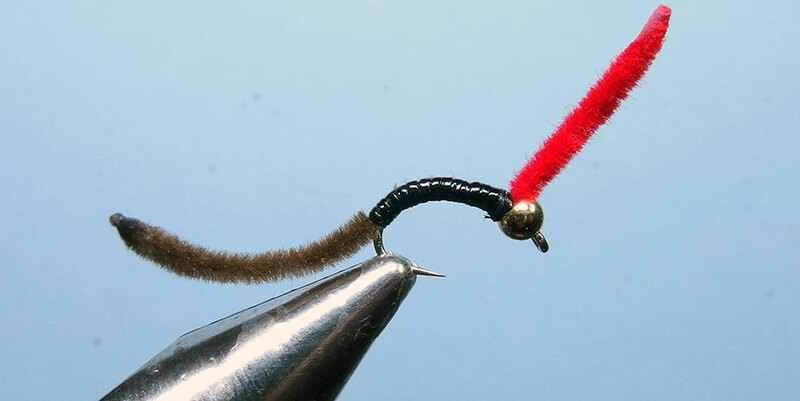 If you don’t care to tie these flies, we sell the first and third in the shop. NOTE: rainbow trout spawning activity begins on the creeks in February. It’s important to let them do their business in peace. Make sure to avoid fishing or walking over redds (spawning nests), which are areas of shallow gravel that the fish have swept clean of algae and debris. These areas will look paler or brighter in color than other gravel. Some redds can be quite large, larger than a dining room table, but most are perhaps three feet in diameter. It’s okay to fish the deeper water downstream of these redds, and in fact these areas are often the best areas to target non-spawning fish, since the spawning activity leaves eggs in the drift and also disturbs aquatic insect larvae/pupae and nymphs, which the fish in the deeper water pick off. All of these pattern should generally be ticked along the bottom with or without a shot, and should be fished in pretty small sizes. Use 5X or 6X tippet. Fluorocarbon is not a bad choice. This simple nymph is my favorite pattern overall in February, regardless of where I’m fishing. 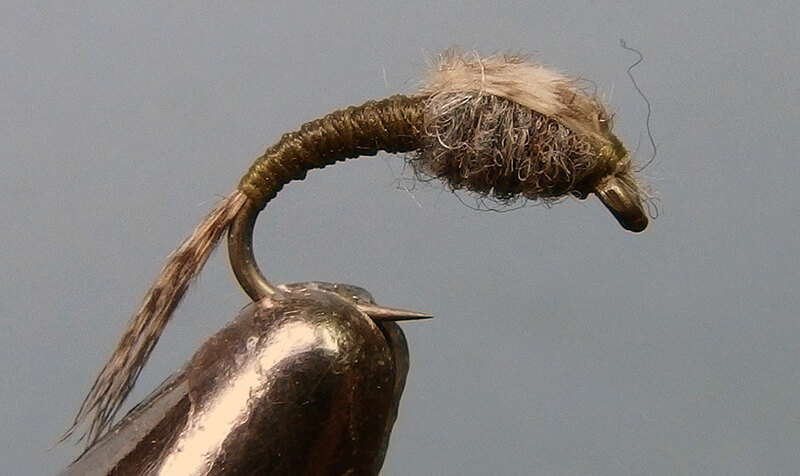 It does a good job imitating both BWO nymphs and midge pupae, making it an excellent crossover pattern covering the two most important food items on the menu at this time of year. Fish it in #18 and #20, with or without a gold beadhead. The wing case can be replaced with tinsel if you want a bit more flash in the pattern. Thread and Abdomen: 8/0 olive-dun. Tail: lemon wood duck flank. Wing Case: lemon wood duck flank. San Juan Worms of all kinds are good choices in late winter and spring, but on the creeks they must be slender and sparse. The tricolor Triple Threat Worm has worked well for me on the creeks for more than a decade. Hook: #16-18 scud (on the creeks, #12 is great on larger water). Thread: 8/0 or 10/0 black. Front Segment: red midge Ultra Chenille. Rear Segment: brown midge Ultra Chenille. Body: Black micro tubing coated with head cement. Some might regard eggs as cheating, but they do “match the hatch,” since as I noted above some eggs drift loose after spawning. These eggs invariably die, and take on a pale creamy pink appearance when they do. This particular egg pattern adds a hint of flash and is realistically small. Other similarly-small egg patterns are also worth a shot. Thread: white 75-100 denier gel spun. Tail: small pearl or opal tinsel. 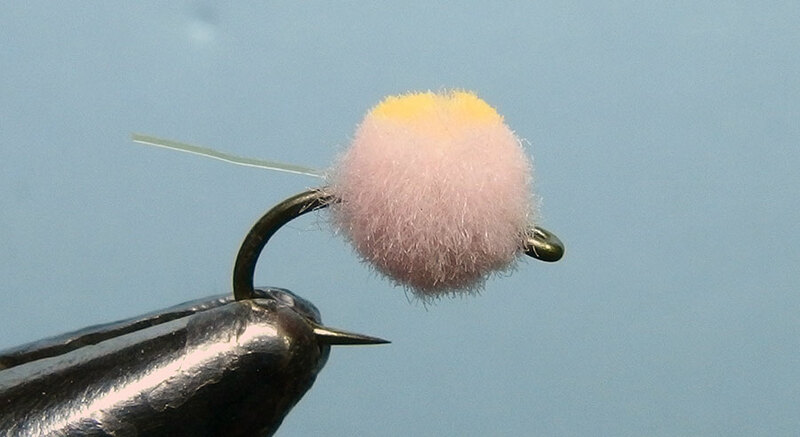 Egg: January or other pale pink McFlyFoam, with an orange eye spot, spun and clipped round. New Sizes of Bob Hoppers for 2019!